The top priorities are often to ensure that wealth is preserved across generations and to avoid the dreaded “shirtsleeves to shirtsleeves in three generations” phenomenon. Many wealthy families turn to investment professionals who make decisions about financial and investment matters exclusively — whose only purpose is to create more wealth. However, in our experience, the most important issues and principles of wealth preservation are qualitative, not quantitative. It’s not just maximizing returns or trying to beat the market. The families that successfully preserve their wealth and legacies across generations are notable for their commitment to communicating openly and sharing the values of the original wealth creators. Our family office team can also facilitate and support family meetings, communication plans and philanthropic strategies. 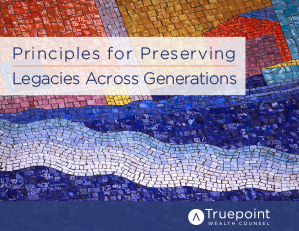 Truepoint’s holistic and integrated approach to wealth management is particularly well suited to families with multi-generational wealth. Beyond comprehensive plans, integration provides direct access to a wide range of expertise – all under one roof. That means you no longer have to coordinate multiple advisors. It’s a different approach than other wealth management firms – one designed to deliver a better client experience. Our advisors and specialists are always ready to answer questions, talk through concerns and help you lead the life and leave the legacy you want. The “Truepoint Way” means always striving to deliver extraordinarily high client satisfaction and increased efficiency in planning and execution. Contact a Truepoint advisor today to learn about our family office and family wealth management services.